To ensure the quality of the products in the rapidly growing solar thermal market, national and international standards for solar collectors, hot water stores and complete thermal solar systems have been established. In these standards, basic requirements for products as well as testing methods for the verification of these requirements are specified. 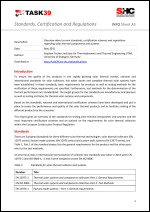 Furthermore, test methods for the determination of the thermal performance are standardized. The target groups for the standards are manufactures and planners as well as testing institutes for thermal solar systems and components.